Diwali, the festival of lights, is one of India’s greatest festivals, celebrated with gusto and verve. For Delhi, though, India’s capital city, the use of firecrackers during the celebration is posing an increasing health risk. Located in a semi-arid region, with heavy traffic and a building boom powered by one of the fastest growing large economies in the world, Delhi is blighted with a pall of air pollution. On top of that, stubble burning to clear fields in the surrounding states of Punjab, Haryana and Uttar Pradesh bring an additional cloud of pollutants to the city, and the colder air of coming winter traps the pollution closer to the ground. Then the firecrackers kick in, and Delhi’s air pollution goes through the roof. Last year, as the air pollution blanketed the city, the National Green Tribunal declared an environmental emergency in Delhi and its surrounding states. From November 7, the Delhi government closed down schools for three days to give the next generation a chance. And yet, things had not been as bad as earlier. In fact, the peak pollution levels in Delhi’s Punjabi Bagh area – one of the most polluted, densely populated parts of the city – saw a small decline compared to pollution levels in 2015. 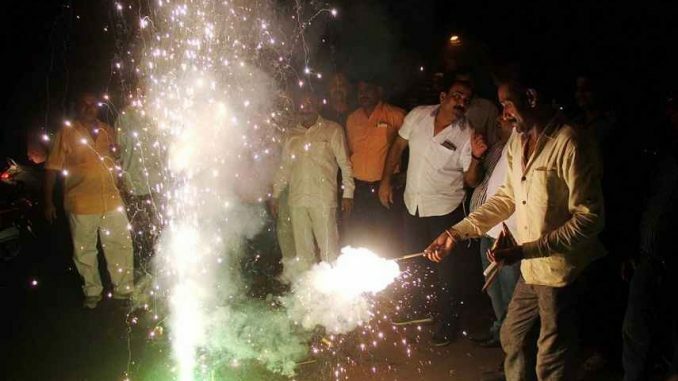 While it is impossible to extrapolate on the small amount of data, this marginal improvement may indicate that Delhi’s residents – assisted by campaigns of the government and NGOs – have taken some small steps to change their usual manner of celebrating Diwali with myriad firecrackers. (i) Suspend all such licences as permit sale of fireworks, wholesale and retail within the territory of NCR. (ii) The suspension shall remain in force till further orders of this Court. (iii) No such licences shall be granted or renewed till further orders. On September 12, 2017, the SC revised the order, giving the manufacturers that had a permanent licence to produce fireworks to gradually lower the sale over time, aiming for a 50% reduction by 2018. In response to this order, a number of petitions — both in favour of a complete ban and one that would ask for liberalising the sale of fireworks — were placed before the SC. The SC resolved on October 9, 2017 that the temporary easing of the conditions of sale of firecrackers should only be allowed after November 1, 2017, by which time Diwali — which is on October 19 this year — will be over. There would, in short, be no legal sale of firecrackers for the festival. If the SC has already understood the scale of the problem, why is an experiment like this needed? Furthermore, given that the earlier order had relaxed the prohibition on sale of fireworks, it is likely that a large amount may already have been sold. The temporary ban will only be able to reflect part of the effect, at best. Whatever happens, though, the increasing action of Indian courts to take an active role in the environment is a striking example of legal activism on behalf of the young. The petitioners in favour of banning firecrackers are Delhi’s children, Arjun Gopal, Aarav Bhandari and Zoya Rao Bhasin, all between 2 and 4 years of age. This follows two cases, in India and Pakistan, of children moving the respective Supreme Courts to do something about the environment. The second aspect is the desperation of getting something done. The Delhi government has tried to stop trucks entering the city, and tried to reach out to farmers in Punjab and Haryana, but these efforts have so far been largely unsuccessful. In 2016 the Delhi government had tried a scheme of allowing only cars with odd numbered licence plates to ply the roads on one day, and those with even numbered licence plates on the next day. This scheme had received an enthusiastic initial response, but could not really qualify as a success against air pollution, and could be seen at most as an emergency measure. The courts match the desperation by some government agencies. In stunning judgements last year, a regional court had granted rights to rivers — and nature. These were based on the court’s deep anguish at the pollution and destruction of two of India’s holiest rivers, the Ganga and Yamuna. The SC has stayed the judgement, after petitions by the state and central governments argued that it would be impossible to implement. At least three constituencies are becoming increasingly desperate vis-à-vis environmental degradation in India: the young, local governments, and the courts. This is pushing a specific form of judicial and governmental activism that has had – at best – mixed results so far. One thing is sure, though. The story is far from over.